This just may be the coolest backsplash I have ever seen. Something tells me you may be right! How gorgeous is that back splash? Is it carrera marble in a honey comb pattern? I must find this! It's definitely an octagonal pattern, but I'm not 100% sure what the material is. I'm inclined to think it's Carrara because of the grey, but it almost has an iridescent factor like mother of pearl. Either way, I love how gorgeous and unexpected it is. This is spectacular! I really love gray and white kitchens. They are so clean and crisp. that is beautiful! 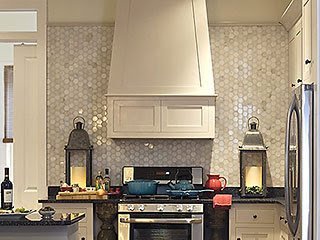 i usually go for the standard subway tile, but since its everywhere now, I love that this is different!